My gankstas!™ series of art prints and online memes, uses photography, manipulated via free filters (from Russia, Ironically enough) to reveal these characters’ voluptuous evil. “DON FUGAZY” - 2017, digital print on acid-free paper, 14.5”x14.5” - “Fugazy” n. - a fake, something bogus, a counterfeit. The word, long a part of New York City slang, was popularized in the 1997 film “Donnie Brasco” starring Johnny Depp and Al Pacino. “PARTY MELT” - 2017, digital print on acid-free paper, 14.5”x14.5” Portrait of Mitch McConnell, a man who more than anyone excepting Trump, has sent this country into a spiral of lawlessness and chaos. And perhaps, the eventual death of the Republican Party. We can only hope. “HYPE MAN” - 2017, digital print on acid-free paper, 14.5”x14.5” Every act needs a hye man, someone to whip up the crowd, and Kellyanne Conway is the Flavor Flav of the Trump Crime Family®. “PAULIE NO-NUTS” - 2017, digital print on acid-free paper, 14.5”x14.5” The most craven, cowardly lickspittle in Washington, and that’s saying something. 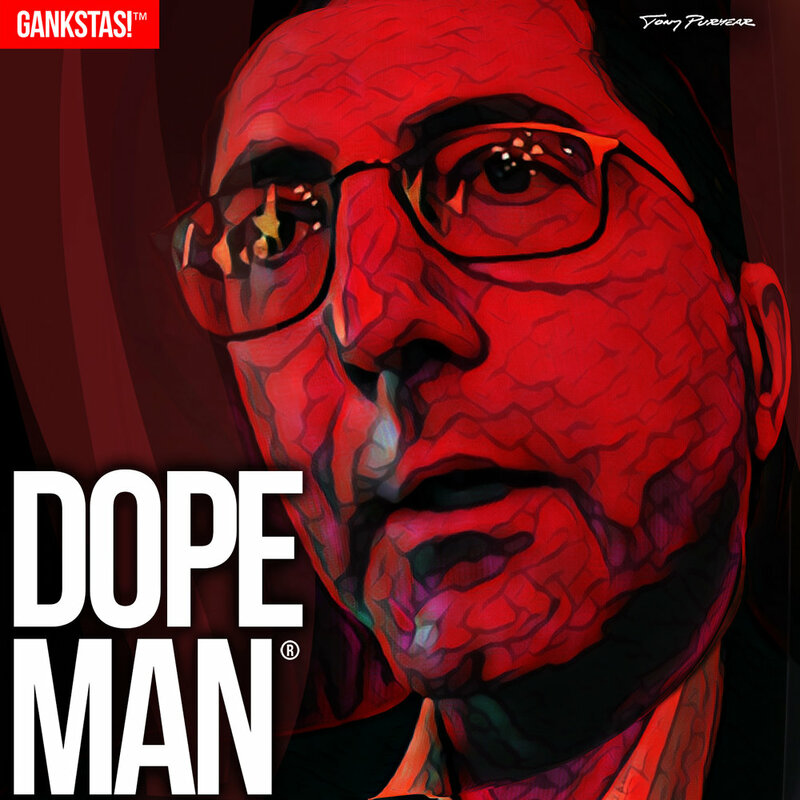 “DOPE MAN” - 2017, digital print on acid-free paper, 14.5”x14.5” Health and Human Services Secretary Alex Azar, a man who, as Chairman of Eli Lilly Co. was responsible for the 500% increase in the price of insulin. “JABBA THE REPUBLICAN” - 2017, digital print on acid-free paper, 14.5”x14.5” Portrait of Sam Clovis, disgraced Republican Party operative. “TOUGH GUY” - 2017, digital print on acid-free paper, 14.5”x14.5” Portrait of disgraced Marcicopa County, AZ, Sheriff and convicted felon Joe Arpaio, recipient of a presidential pardon from Donald Trump. “WE’RE GONNA PARTY LIKE IT’S 1954” - 2017, digital print on acid-free paper, 14.5”x14.5” Lindsey Graham exults after the confirmation of Brett Kavanaugh to the Supreme Court.